KUALA LUMPUR, Malaysia More than a dozen pygmy elephants found dead and possibly poisoned in Malaysian forests were in reserves slated to be converted into plantations, the wildlife group WWF said Thursday, raising the prospect that they were deliberately killed by humans taking over their habitat. Authorities found the carcass of another endangered Borneo pygmy elephant, believed to have been dead for two weeks, in the Gunung Rara Forest Reserve late Wednesday, marking the 14th such death since December. The elephants are feared to have been poisoned because they encroached on Malaysian plantations, giving fresh urgency to activists' warnings of rising conflict between man and wildlife as development accelerates. The WWF said the dead elephants were found in areas where forests were being converted for plantations within permanent forest reserves. "The central forest landscape in Sabah needs to be protected totally from conversion," the group said in a statement. "Conversions result in fragmentation of the forests, which in turn results in loss of natural habitat for elephant herds, thus forcing them to find alternative food and space, putting humans and wildlife in direct conflict," the WWF said. Sabah, one of two Malaysian states on Borneo island, is home to endangered animals including the pygmy elephant, Sumatran rhinoceros and orangutan. Wildlife activists say their numbers have dwindled in recent decades because of illegal poaching and the loss of jungles cut down for timber and development. Although Malaysia is increasingly industrialized, large-scale agriculture and forestry are important sources of employment and revenue for many rural households. Some 60 percent of Sabah state is currently under forest cover, but activists say the deforestation rate is rising, with large forest areas slated for conversion to farmland or timber concession. The first 10 known deaths of the pygmy elephants were made public this week, capturing wide attention as only about 1,200 of the elephants exist worldwide. Authorities released several photographs of the elephant carcasses, including a particularly poignant one of a 3-month-old surviving calf trying to wake its dead mother. The male calf was taken to a Sabah wildlife park and appeared healthy. 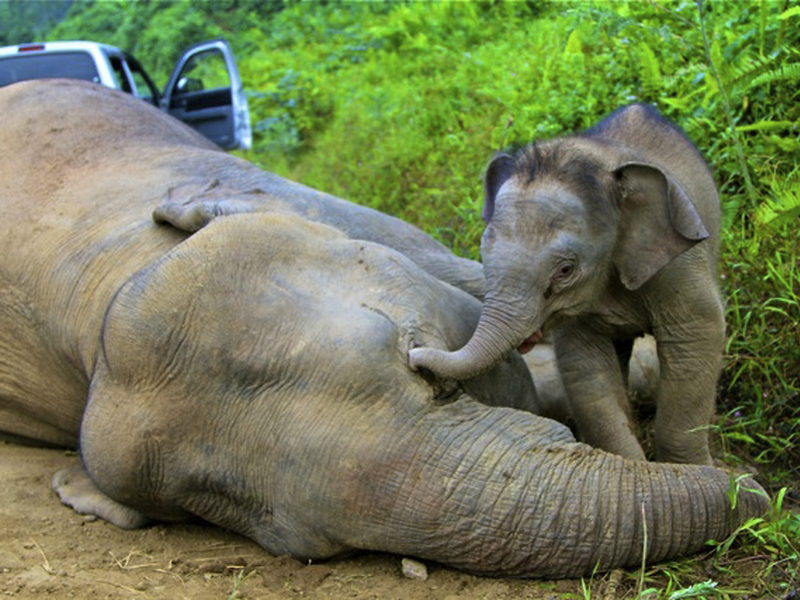 Sabah wildlife director Laurentius Ambu said Thursday that the area where the dead elephants were found is part of a 100,000-acre (40,469-hectare) piece of "commercial forest reserve" land managed by state agency Sabah Foundation. He said the area was slated to be used as a tree plantation for sustainable logging. So far, two palm oil plantations and a logging company operate in the area, he said. Ambu said far too many jungle areas in Sabah were being broken up by agricultural or logging activities, without corridors linking them to allow animals to pass through. "This shouldn't be. The fragmentation of forests has disrupted the elephants' traditional routes to look for food," he told The Associated Press. "It is highly suspected that the poisoning is blatantly done or that it's a well-planned program." Department veterinarians have said the dead elephants, believed to belong to a single herd, suffered severe bleeding and gastrointestinal ulcers. Ambu said there were a few cases in the past where elephants were found poisoned to death on plantations, but not on such a large scale. Most of the pygmy elephants live in Sabah and grow to about 8 feet (245 centimeters) tall, a foot or two shorter than mainland Asian elephants. Known for their babyish faces, large ears and long tails, Borneo pygmy elephants were found to be a distinct subspecies only in 2003, after DNA testing.